I tried to install OpenVPN and I found the process long and complicated and at the end, I had issues. I searched on the forum for an alternative like hamachi, neorouter and found nothing useful. I was able to setup Neorouter but I had few issues and I discovered SoftEther so I decided to give it a try. 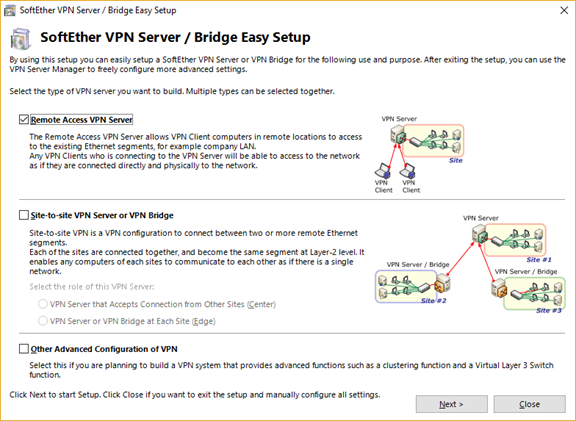 Here is what you need to do to install a SoftEther VPN that will give you access to the server remotely and securely or you can also create a VPN bridge that will give you access to the complete remote network. I need feedback from FreeNAS guru for advice regarding the security and/or configuration. First, I'll do that in a jail because it's easy to try again or disable if needed. So create a jail with the FreeNAS GUI, jails, add jail and give a name. When the jail is created, open a shell inside this jail. pkg install lang/gcc (this one takes a long time). Select 1 for the license agreement, 1 for the understanding of the license agreement, and 1 to agree the license agreement. ps aux to see if vpnserver is running. Everything else will be made with the server manager. Connect to the IP address of the jail with no password. At first login, it will ask you to generate the password. It will propose you to automatically create a DNS address for you at softether.net. If you don't want to have any configuration to make on your router, you can also setup a VPN Azure cloud address for free. If not, you'll have to open port 442, 500, 4500 and maybe others. 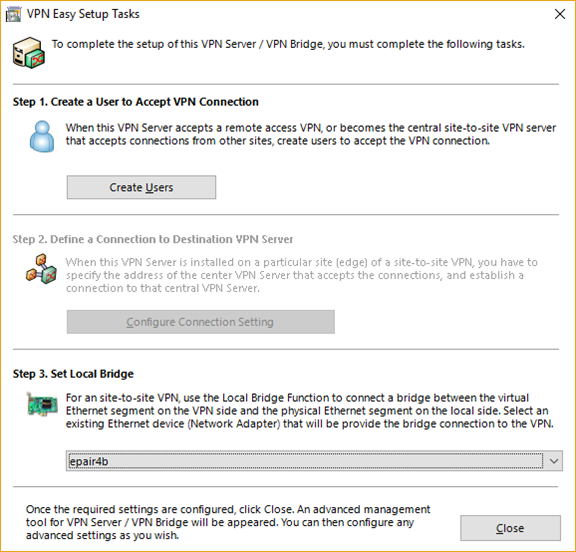 Create your users at this screen and to not forget to setup the local bridge by selecting the epair adapter. You can create users with password authentication only but certificate is a better idea. After that, download the SoftEther VPN client, enter the VPN Azure cloud address or your DNS address, username and password and you're ready to go! Great guide, I managed to get everything installed, I got a problem though. I get everything installed easily, and I can connect using SoftEther Server Manager. I set everything up using the VPN Azure Cloud and try to connect using a certificate, but it keeps saying I can't connect. I'm trying to do this from my Macbook Pro. I've opened all my ports (all the ones I can find to open) but still can't connect. I'm not sure. If you're using the Azure cloud, you don't need to open any port at all. Maybe you can you try with simple password authentification to begin?! I will try and see if I can connect using just a username and password. The strange thing is, I can connect to the VPN when I'm inside my own network (from my desktop PC). But when I share my 4G connection from my phone to my Macbook, I can't connect. I connected with a standard username and password (using the Azure cloud), still doesn't work. I can connect to the VPN from my own network, receive an IP, but I have no access to the internet. I can however, ping my NAS, my gateway etc. I have found even with the bridge in place the VIMAGE isn't allow the DHCP traffice of the local net to be routed into the VirtualHub. With OpenVPN client this was returning an "authentication error" however the server logs we showing "IP address cannot be assigned"
Removing the VIMAGE setting from the jail has resolved the issue and I was able to connect with the above setup. Have reactivated the VIMAGE setting and established the bridge between virtual hub and to the jail internal virtual interface (epair0b) . This time it works so I am not sure why it didn't work the first time. Suprazz, you are the best! I have tried OpenVPN but it didnt work. I was able to install OpenVPN properly but I had this "TLS Error: cannot locate HMAC in incoming packet" lovely error and any advice didnt work form me. Bud with Soft ether everything works like a charm. THANK YOU! thanks for details. I usually use OpenVPN, however it is very temperamental (for me) as far as routing, plus it needs its own client. Last straw was OpenVPN install for my in-laws, couldn't get routing work properly. SoftEther, especially based on your guide, worked pretty much right away. Just one hiccup - Comodo blocked ARP packets from FreeNAS to SoftEther VPN Client Manager. Native Windows firewall prompted to add client software to the list. One more issue - using build-in L2TP client on Android (Galaxy S9) vs OpenVPN on same device, SoftEther is about 100KB/sec slower. Not a dealbreaker, and so far easiness of config outweigh slightly slower link. Also, need to see how it will behave on 3rd party networks. OpenVPN was easy - just use port 443. L2TP needs more ports to be open. From now on adding SoftEther to my arsenal of FreeNas tools. Just trying this on 11.2. I can't get the bridge online. I've tried enabling tun on the jail with "iocage set allow_tun=1 <jail-name> ". I've also got "allow.raw_sockets" and "allow.socket_af" enabled in the jail settings. My jail config is I've bound the jail to a spare NIC on the server. Specifying a static IP address, with "VNET" and "Berkeley Packet Filter" both disabled.